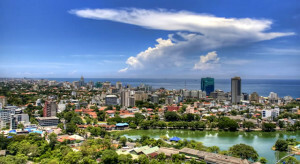 The route will be served by a US-built Boeing 777-300ER offering 354 seats in a three-class configuration, with eight luxurious private suites in First Class, 42 lie-flat seats in Business Class and 304 spacious seats in Economy Class. You don,t have to leave a flight with a stiff neck and swollen feet. There are several ways to keep good posture on a plane. Most important things to know are where to put your head, how to keep your blood circulating and the best ways to support your back. While it’s important to put smaller bags under the seat in front to save space in the overhead cabins. It’s also very important to keep a decent amount of leg room. Make sure to leave some room around your feet for stretching out and to keep the circulation flowing in your legs. You have to keep your joints supple and circulation moving. A good way to keep your joints supple and circulation moving is to take a loo break. This short walk to and from the toilet will do wonders for your body. Plane seats are tailored to support your back. Make use of the curves in the chair and allow it to support your lower back, instead of sitting forward. Etihad Airways will offer loaner iPads and free Wi-Fi connectivity to first- and business-class flyers on flights effected by banned laptops and tablets on some direct flights to the U.S.
An Etihad spokesperson said that the iPads and free Wi-Fi will be available to first- and business-class guests on April 2. “To help guests keep in touch with work, friends and family, we are offering First & Business Class guests free WiFi and iPads on all our US-bound flights, beginning Sunday, April 2nd. Etihad said in an email to Business Insider. The announcement will apply to the passengers flying from Abu Dhabi to the handful of US destination served by the airline — including New York, Washington D.C., Chicago, Dallas, San Francisco, and Los Angeles. Economy class passengers will not be included in the program. Etihad’s loaner iPad program is the latest attempt by one of the nine airlines affected by the US government’s laptop ban to offer passengers an alternative means of internet access. Earlier this week, Turkish Airlines announced on Twitter that passengers who turn in their laptops and tablets at boarding will receive free WiFi on board. Last week, Emirates implemented a laptop handling program that allows passengers getting on US-bound flights to have access to their laptop until boarding. The Dubai-based carrier has also hinted that it may offer loaner laptops. Passengers on flights to the United States from eight countries in the Middle East and Africa will not be allowed to bring any electronic devices bigger than a smartphone on board because of new security restrictions from the Department of Homeland Security (DHS).The Transportation Security Administration (TSA) notified a number of international carriers flying those routes that starting March 21st 2017, passengers will have to check iPads, Kindles, laptops and other devices before going through security or boarding because of safety concerns. Nine carriers are being impacted by the new rule—Egyptair, Emirates Airline, Etihad Airways, Kuwait Airways, Qatar Airways, Royal Air Maroc, Royal Jordanian Airlines, Saudi Arabian Airlines and Turkish Airlines. No U.S. airline will be affected as none flies nonstop from the 10 cities included—Cairo, Egypt; Dubai and Abu Dhabi, U.A.E. ; Istanbul, Turkey; Doha, Qatar; Amman, Jordan; Kuwait City; Casablanca, Morocco; and Jeddah and Riyadh, Saudi Arabia—to the United States. Both Royal Jordanian Airlines and Saudi Airlines confirmed the changes on Twitter on Tuesday morning. Royal Jordanian said that its flight To Montreal, which continues through Detroit, would also be affected. UK Government has also implemented new security requirements for cabin baggage on direct flights from Egypt, Jordan, Lebanon, Saudi Arabia, Turkey and Tunisia to the UK. 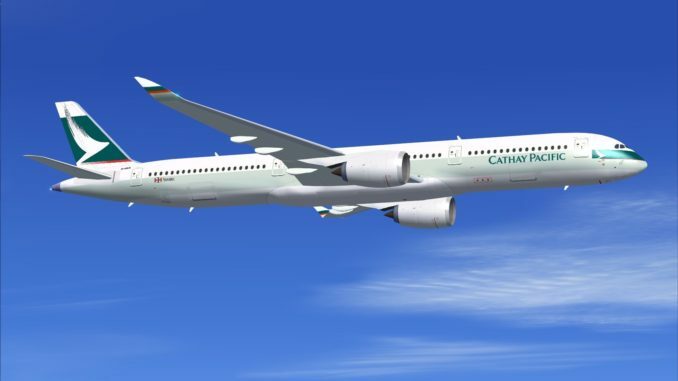 Cathay Pacific announced four additional non-stop flights between San Francisco and Hong Kong, using the new Airbus A350-900, featuring a refreshed Business Class cabin. This will be the airline’s first A350 deployed in the USA and second in North America. At the same time, flights to Los Angeles will be reduced from 28 to 21 per week. These changes come on top of previously announced additional services that will operate to Vancouver and Boston from late March. 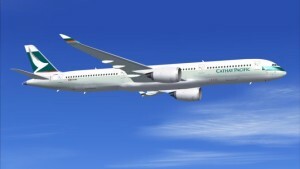 Cathay Pacific’s new A350-900 have some really good features. Design of the cabin features has been carefully considered to give passengers the best sleeping experience, the best entertainment, and to offer them more control over how they want to use the space. Aircraft offers more space and comfort, a quiet cabin, panoramic windows and LED mood lighting, contributing to a more comfortable and relaxing journey in all cabin classes. The A350-900 Business Class seats are build on the success of the airline’s award-winning long-haul Business Class product. On side of fully-flat bed, new features includes extra stowage space within easy reach and the personal service offered by a “Do Not Disturb” and “Wake-up Call” function in the entertainment system. 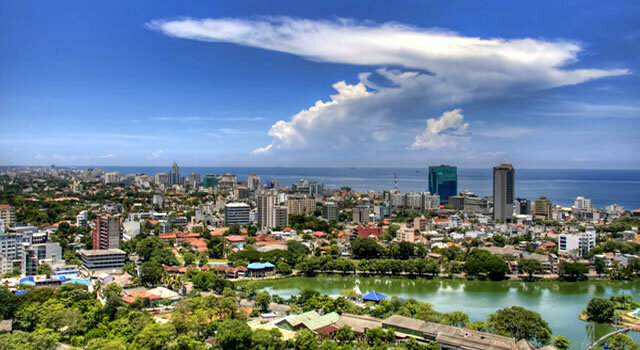 The gorgeous, tropical island country of Sri Lanka is pleasantly uncrowded and offers vacationers a luxurious stay, especially in its cosmopolitan, coastal capital, Colombo. 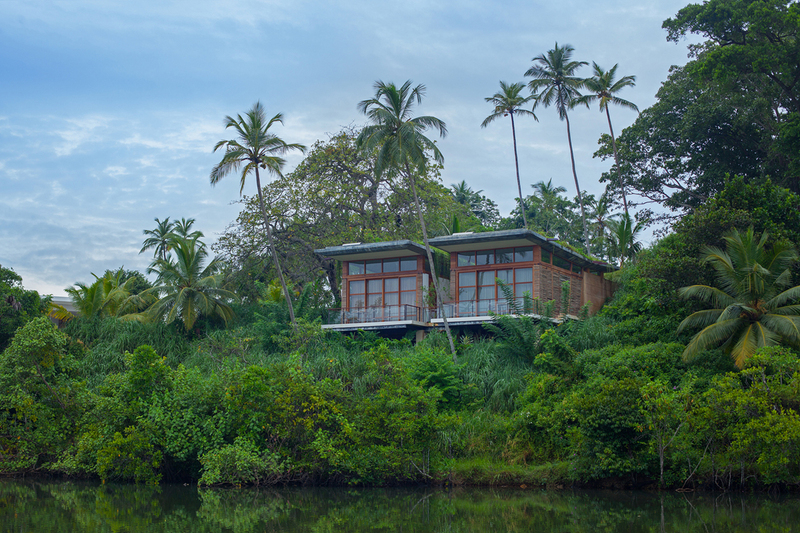 On the southwestern part of the island in Galle, the newly-opened, designer hotel, Tri Lanka is equally as luxurious. Sri Lanka has the most amazing ruins and miles of beautiful beach to explore. There is nothing quite like an African safari and Tanzania is definitely the place to go if you feel this way inclined. A visit to the Serengeti National Park is a once in a lifetime experience. 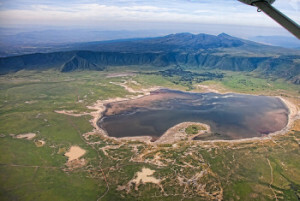 In addition, the Ngorongoro Crater, Lake Manyara and Arusha are also just on your doorstep when visiting Tanzania. Japan has just made it easier for vacationers due to the fact that a direct bullet train now links Tokyo with Hokkaido (the northernmost of its islands and considered to be Japan’s natural masterpiece). If you go to Hokkaido in the summer, you can camp, hike or go climbing while admiring the beautiful lakes, hot springs, mountains and forests. Winter isn’t bad, either with the Niseko resort offering the most amazing skiing. South Africa’s “mother city”, Cape Town with its iconic Table Mountain, wine farms, botanical gardens and sunny, sweeping beaches is another popular favorite, especially since tourists get the opportunity to visit Robben Island by boat and see the famous cell in which inspirational, Nelson Mandela was held for 27 years. What to wear? The rules of fashion are bit different in-flight than the ground. When flying up to 35,000 feet in the air in a metal fish (planes always remind me of big fish), choose comfort over the fashion. Of course, you cannot look shabby. Dress well but make sure that you do not opt for clothing which might cause discomfort during the flight. Look like a traveler that you are rather than a fashion faux pas in distress. Avoid fabric which do not let air pass through them. Like leather, nylon or rubber material. They do not let air circulate and keep sweat from evaporating. You will certainly feel not too fashionable all hot and sweaty in your synthetic clothes now will you? Air ports are busy places. People sprint rather than walk. Though this point is obvious still I see some women teetering in high heels. Comfy shoes make brisk walking easy at the airport. Packing pointer – wearing your sneakers may save you up some packing space and weight as well. Avoid tight clothing especially. Deep Vein Thrombosis causes dangerous blood clots in veins which is fatal. Long periods of sitting increase the risk of DVT as well as tight clothes. Be it your socks or undergarments even. Avoid them if they leave marks. The plane air is dry. Occasionally, humidity is 1% even. Contacts can cause discomfort because of the dry cabin air. Your eyes can dry up so keep a pair of glasses to change into in such a case. Also don’t forget to bring moisturizing eye drops. Airlines do have dress codes. Dress inappropriately always. 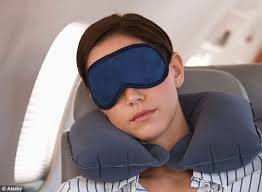 If you cannot wear it to a family dinner you probably should not wear it on a flight where personal spaces get overlapped. Tees splashed with obscenities or offensive message, too short or plunging dresses are a big no-no, some people have even been kicked out of the plane for that. Strong smells are also a big no. No matter how expensive or fancy your perfume is, other passengers can find it offensive. Some people can have immediate headaches caused by scents. Just avoid it all together and focus on hygiene. If you have good hygiene and have a bit of anti-perisperant you should be all set. I have travelled a lot and the variety of shoes I see always surprise me. Remember you need to be able to quickly take them off during security checking so stick to sneakers or sandals that you can slip on and off easily. You also want to be able to quickly take them of or on mid-flight in case you want to take a quick stroll up and down the aisle, use the bathroom, or if your feet get cold. Avoid shoes with too many straps, buckles, zips, laces, etc. Aircraft lavatories are tricky and tight places. So getting out of a bodysuit, wrap tops or dress is trouble. Avoid long pants and skirts too which may graze the washroom floor causing you to feel doubtful. Keep it simple and comfortable. For business travelers, it is extremely important to be flexible and to have all the amenities they need and at the right price too. Economy class is cheaper, but it can’t provide the services, and conveniences business travelers need. You can’t take a lot of baggage, and you don’t earn good mileage bonuses. First-class tickets, on the other hand, can cost twice as much as a business-class ticket, but offer similar amenities and not a lot more mileage bonus. At Sunline Travels, we know how important cheap and discounted Business Class flights for business travelers and what amenities they need. That is why we have a great selection of flights that will fit the needs of even the most demanding business traveler, and at an unbeatable price. 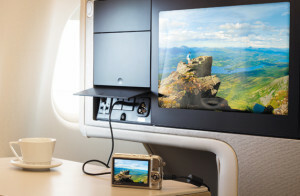 Singapore Airlines entertainment console with USB ports and power outlet. Above all else, Business Class lounges are carefully designed to allow business travelers perform their duties and continue their work even during their flight. Businesses often send their employees to distant countries and getting there could take quite a while. That is why it is important not to waste this precious time and ensure you will have a surrounding that boosts your productivity. Business Class lounges feature numerous amenities, such as additional spacious desks, USB ports and power supplies to facilitate the work of all business travelers. And in today’s fast-paced world these amenities are a necessity for every business traveler. Although various airlines offer different amenities and services, almost all have a business class that shares many luxurious features offered by the first class, but at a much lower price. They usually come with a special flat bed seat, all the food, and beverages your employee might need, and plenty of other amenities. In addition, at Sunline Travels we have a great selection of cheap business class flights that will help business travelers get to their destination safely and comfortably, and at the same time will save them a lot of money. Another great advantage of business class flights is the amount of mileage bonuses travelers can earn. Usually, a first-class ticket would cost you almost twice as much as business class would. However, you only earn miles at a 150% rate, while business ticket earns you just 25% less mileage bonuses. In addition, the cheap business class tickets you can get at Sunline Travels make purchase of first class seat even less cost effective. Last minute flights are our speciality! https://www.sunlinetravels.com/wp-content/uploads/2016/04/SLPreLoad-01-300x139.png 0 0 https://www.sunlinetravels.com/wp-content/uploads/2016/04/SLPreLoad-01-300x139.png 2016-06-21 19:12:202016-06-21 19:12:20Last minute flights are our speciality! There is often great confusion as to the difference between business class travel and first class travel and many people mistakenly believe that they are one and the same thing. This could not be further from the truth. These two classes of travel vary greatly and, depending on your travel requirements, will determine which class you will inevitably select. If you value privacy and ultimate comfort on flights, especially during long-haul flights, you may want to opt for a first class ticket. The reason for this is that many airlines offer private, enclosed seats with amenities such as your own private workstation, tv and wide-angled bed that can lie completely flat. As the name suggests, business class was originally targeted at the corporate market and today, most business class passengers are still businesspeople flying off to meetings in other cities for business travel. This is due to the fact that most high-end companies can afford to fly their employees business class but, in return often expect them to work while flying in their comfortable business class seats. Although not quite as luxurious as first class, business class enables one to experience a very comfortable flying experience at a cheaper price than a first class ticket. If you are thinking of flying in your personal capacity and believe that a business class or first class ticket is out of your price range, think again! Travel agencies such as Sunline Travels, who specialize uniquely in first and business class travel can often find you cheap business class tickets and discounted first class tickets which can make the discomfort of long-haul flights so much more comfortable. Of course, if you travel frequently, using your frequent flier miles can also help you to obtain a discounted business class flight or even a cheap first class ticket. Whichever way you look at it, business class and first class travel is definitely that way to go!